Discussion in 'Designers and Collections' started by Lena, Feb 18, 2004. Not all post-show phone calls come from starlets looking for a cute dress. 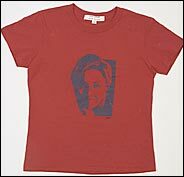 On Monday, Sen. Hillary Clinton phoned Marc Jacobs’ Robert Duffy to say she wanted to stop by the Marc by Marc Jacobs store on Bleecker Street to thank the staff personally for raising money for Friends of Hillary via a special T-shirt Jacobs designed with her likeness. The shirts, in numerous silk-screened colors, have been a big hit since they arrived last week. Much of the first printing of 350 is sold out; a second run of more than 700 will hit the Jacobs’ stores later this week. The short-sleeved version sells for $55; the long-sleeved, $60. The impromptu T-shirt sale is only the beginning of the Jacobs-Duffy political efforts in this election year. After low-keying it this season in the party department, the two plan to make next season’s big post-season bash a Democratic fund-raiser. I'd rathe wear Guiliani's face than her's. thanks for the pic lena! I would totally wear one of these shirts just because I'm a huge Dem. supporter. Would like to see the shirt in other colors. Would anyone online carry it or would i have to phone an MJ store to get one? i think you may need to contact the NYstore since those are a 'limited edition' line, they should be available in more colour combinations. personally i think they are fun, even as a joke. i wouldnt mind seeing more american designers mixing fashion with politics. It's in both his SoHo and Village store windows. They are both withing the walking distance from my work, so if any of you seriously wants this shirt, I'll be happy to pick one up and send it to you. oh I like it its cute. I wish it was a photo from her headband days... I am still searching for one but they seem to have been banished from the internet. Anyone got one? WASHINGTON — Senator Clinton’s newest fund-raising gambit is selling supporters a $55 T-shirt by fashion designer Marc Jacobs, featuring the former first lady’s face in the style of iconic silk-screens of Marilyn Monroe and Chairman Mao. “Your new wardrobe will reveal only your politics,” is the pitch for the T-shirts that were selling by the hundreds yesterday at the Marc Jacobs flagship store in SoHo and on the Web site friendsofhillary.com. Dubbed “New York’s dauphin of grungy, understated cool” by Vogue magazine, Mr. Jacobs depicts Mrs. Clinton in contrasting colors of purple, orange, pink, gray, powder blue, red, and brown. His design evokes the Marilyn and Mao portrait series created by popartist Andy Warhol in the 1960s and ’70s. “Most curators and people who have written about his work see it as making a pop star into an icon,” said the assistant curator at the Warhol Museum in Pittsburgh, Matt Wrbican. “Some people consider the repetition to be about things that are boring,” he added. • Hillary” tag sewn inside and was printed by a union printer, according to Friends of Hillary. The project came about several months ago when the Marc Jacobs company president, Robert Duffy, approached Mrs. Clinton’s campaign committee, Friends of Hillary, said a political aide to Mrs. Clinton, Patti Solis Doyle. A spokeswoman for Mr. Jacobs confirmed the account, but declined to comment further yesterday. While Mr. Jacobs’s T-shirts can sell for hundreds of dollars, the longsleeved version of the Clinton shirt sells for $60 and the short-sleeved one is $5 less. All payments are considered campaign contributions. Federal law restricts individual campaign contributions to a political campaign to a maximum of $2,000, but there is no limit on gifts of high-priced fashion design or brand imprimatur. “As long as the fashion designer is not getting paid [by the campaign] or by someone else, he can donate his talents,” said a Federal Election Commission spokesman, Ian Stirton. The FEC treats Mr. Jacobs’s labors identically to those of campaign volunteers who make phone calls or canvass door-to-door for political candidates,he said. “Whatever talents you bring are your business,” he said. Ms. Doyle said the number ordered would depend on demand.The Web site had received 200 orders by midday yesterday. “They’re very cute,” she said. “This opportunity is indicative of the innovative approach people like Marc are taking to support change in our country,” she said. Ms. Doyle said Mrs. Clinton had recently visited a Marc Jacobs store in New York, but she said she was not privy to what, if anything, the senator purchased. This is not the first time a politician has appropriated the Warhol look to raise funds. Plastered on T-shirts during the 2001 Massachusetts gubernatorial race was a Warholesque series of faces of Steven Grossman. Mr. Grossman later attracted attention as the national campaign chairman of Howard Dean who abruptly and publicly left the Dean campaign this week. The T-shirts left one group ill-humored, however. Officials at the New York-based Union of Needletrades, Industrial and Textile Employees, Unite, said they faced “a vicious anti-union campaign” last autumn when they tried to unionize the Los Angeles plant of American Apparel, the T-shirts’ manufacturer. “She should use a company that respects workers’ rights to organize,” a Unite spokesman, Steve Wishart, said of Mrs. Clinton. Unite officials emphasized that they consider Mrs. Clinton to be a wellmeaning “friend of labor,” but they complained that American Apparel was dining out on a reputation for social consciousness that they said is illdeserved. While conceding that the $10 dollar an hour average wages paid to the company’s workers are high by industry standards, the union said workers complained about a lack of paid leave days, an exhausting pace of work, and lack of job security. American Apparel last week settled a union-busting complaint that Unite had made to the National Labor Relations Board. A senior partner in American Apparel, Dov Charney, said the union’s allegations are “ludicrous” and that their complaint was a “sham” driven by selfinterest. He said his company has waiting list of 2,000 workers because his wages are three times as high as in other Los Angeles garment factories. “I have people begging me to hire their relatives,” he said. The 35-year-old entrepreneur said he gives workers his cell phone number and maintains an open door policy on complaints. He said his company has been targeted because it shows the unions are not necessary to create a positive work environment. “Unions are one model, and there are other models of cooperation. We are passionate about making sure our workers love working at the company,” he said. “This is a huge success story that challenges the concept that in order for a company to claim that its workers are well treated they have to be unionized. “It’s a huge conspiracy to funnel money to their political candidates who then owe them a favor,” he said. Mr. Charnery said his company is “paving a Third Way” between socialism and capitalism. i find this a great pr idea and as i said already ..why not?